A simple side dish that comes together in 10 minutes, tomato garlic Parmesan couscous is an easy and fast recipe to accompany any meal. The end of summer has really thrown off both my cooking and my blogging! I’ve been busy working, and just enjoying these last few remaining days until – gasp – my senior year of high school! Yes, my last year… oh man, please excuse me while I go hyperventilate. eek! Whew. What a year this is going to be. I still have no idea what my plan is afterwards, but I have some time to figure that out. I was in the mood for a quick snack, but something different then say my favourite crunchy snack – granola, or my favourite chocolate snack – brownies, or my favourite, super healthy snack – sweet potatoes. So after about 20 minutes of sifting around the kitchen for something to eat, I finally found it, the one and only couscous and just like that, this tomato garlic Parmesan couscous was created! While I ate this plain on its own, it’s the perfect accompaniment for pretty much any main. However, if you’re looking for a simple recommendation make my perfectly roasted chicken thighs or my slow cooker chicken legs with sun dried tomatoes. So what is couscous? While it looks like a grain (sometimes people confused it for quinoa) it’s actually pasta. It’s typically used in African dishes (you can try my Moroccan Couscous salad for a more typical preparation), but for this recipe, I was inspired by Italian flavours and opted for the combination of tomato and garlic with added herbs. I opted for dried herbs for this couscous recipe because I wanted to keep prep minimal (literally 5 minutes, guy) and also dried herbs are more budget-friendly, plus I always have them in my pantry. There’s something to be said for having a variety of side dishes in your repertoire that can be made out of ingredients you already have in your kitchen. In a medium pot, bring water to a boil and add the couscous, return to boil, cover, remove from heat and let sit for 5 minutes. While couscous is sitting, heat olive oil in a pan and add the garlic, cook until fragrant, about 1 minute. Add herbs and cook for another minute, then add the tomato paste and stir to combine. 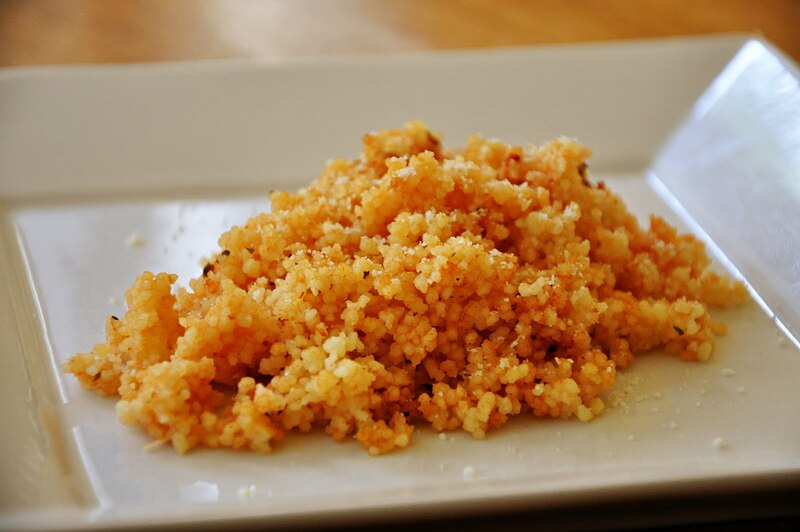 Once the couscous is done cooking, fluff with a fork and add to the pan of garlic, herbs and tomato paste. Mix to combine and add Parmesan cheese. Remove from heat and serve with extra Parmesan cheese! This makes a great quick snack and would also make the perfect side dish. It takes literally 10 minutes or less to make. Let me know if you give my tomato garlic Parmesan couscous recipe a try in the comments below. Oh yum, this sounds a delish way to dress up boring cous cous. Thank you so much! Definitely a fun way to change up couscous, which when eaten plain is rather lackluster! Hi! Made this tonight for the fam. Substituted tomato paste for fresh tomatoes as that is what I had at home. Kids loved it!